We have some brand new images, and a new poster, for Godzilla: King of the Monsters. If things had worked out as originally planned, this movie would be coming out this month and we would be mere days away from seeing what is poised to be an absolutely epic monster brawl for the ages. Instead, we've got to wait a couple more months, which means we have to put up with more teases such as this, which include a few new epic shots of Godzilla and the gargantuan King Ghidorah. Two of the new images focus heavily on King Ghidorah, the three-headed dragon beast that Godzilla has squared off with several times throughout his long history. One image showcases the beast on his lonesome, which is perhaps the best look at the new version of this monster overall. Another image teases the showdown between Godzilla and Ghidorah, which we assume will be the movie's climax. A couple of other shots focus on the stacked human cast, including a solo shot of Ken Watanabe, who returns for the sequel. Meanwhile, another shot sees Millie Bobby Brown and Vera Farmiga taking what looks to be a rather dreary elevator ride. Elsewhere, from the same batch of photos, we've got a couple of covers for the latest issue of Total Film Magazine, which highlight the titular beast in all of his gigantic glory. There is also a new Japanese poster which sees Godzilla and Ghidorah squaring off in Washington D.C. and, again, the word here is epic. So, a lot to look at without giving too much more away. It's very clear that this is going to be a monster-focused, massive scale blockbuster through and through. Even with nothing else, these photos make it quite clear that there would be plenty of destruction to go around. Yet, these photos don't include Mothra or Rodan, who are also joining the fold in this long-awaited sequel. 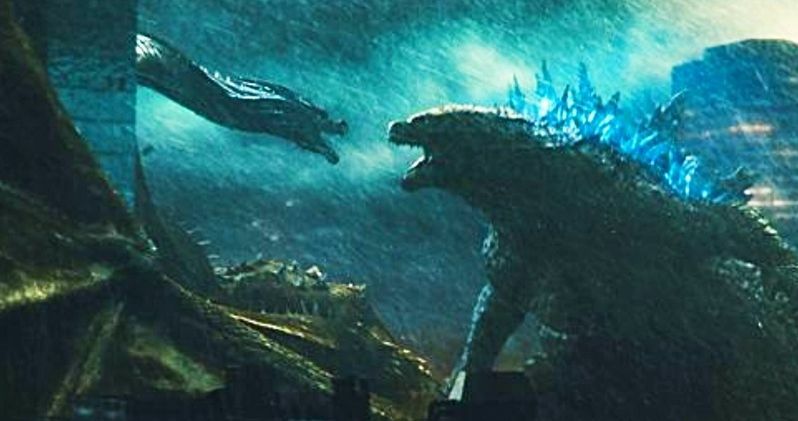 The trailers have focused heavily on all four beasts and, though it hasn't been explicitly laid out, it seems very much like it will end up as Godzilla and Mothra vs. Rodan and King Ghidorah in what will hopefully be a tag-team match for the record books. The cast also includes Sally Hawkins (The Shape of Water), Kyle Chandler (Manchester by the Sea), Bradley Whitford (Get Out), Charles Dance (Game of Thrones), Thomas Middleditch (Silicon Valley), Ziyi Zhang (Crouching Tiger, Hidden Dragon) and O'Shea Jackson Jr. (Straight Outta Compton). Michael Dougherty (Krampus) directs. The 2014 live-action Godzilla was directed by Gareth Edwards, who did not return for the sequel. Ultimately, that may prove to be a good thing for those who were frustrated by the way he subverted the action in his movie. Godzilla: King of the Monsters is set to hit theaters on May 31. Be sure to check out the new photos from Games Radar below. New Total Film issue showcases a new, STUNNING shot of Godzilla from the upcoming film, 'GODZILLA: KING OF THE MONSTERS'. Godzilla: King of the Monsters will be the best movie of 2019.